I like this beta. I like its stability. I like what it seems to tell me about Apple’s direction with the Mac. 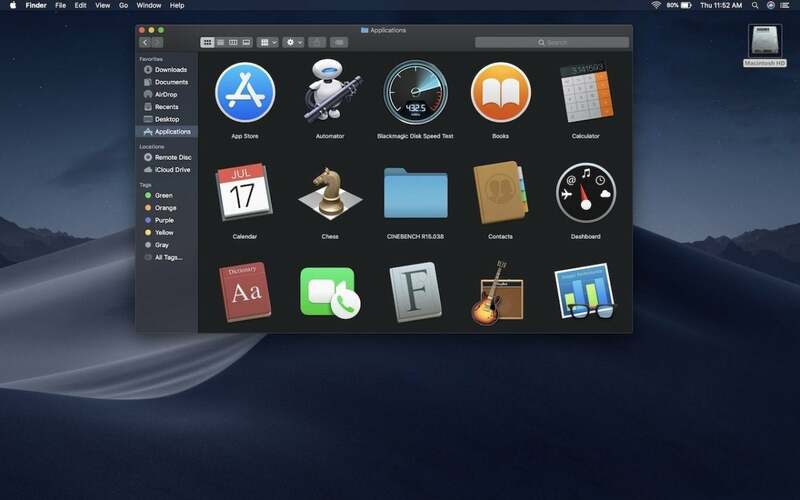 First impressions count, and that’s why all the preview posts start with macOS 10.14 Mojave’s Dark Mode. But beyond that eye candy, the message inside Apple’s latest OS stays true to the core of the company’s belief: It’s all about you. While there’s a whole lot going on under the hood (Metal, CoreML, AFPS, to name but three) most Mac users live on the surface of their machines. We use them to get things done. We use them for different tasks and in different professions at different levels of skill. These “bicycles for the mind” are creative tools creative people use to get things done. Which is precisely why Mojave matters. Think about the enhancements made in this release, yes, even Dark Mode. This OS helps you organize your tasks — helps you get things done on an ad hoc basis from within the Finder with Stacks, Gallery View, and Quick Actions. Continuity Camera lets you use your iPhone as a document scanner, plus you get improvements in Screenshots. Application developers get the benefit of a much-improved App Store that may help Mac users find the apps they need to help get things done. We all benefit from Apple’s big promise that starting in 2019 developers will be able to easily port iOS apps over to the Mac, delivered this year in the form of enhanced versions of applications that iOS users open often: News, Stocks, Voice Memos, and Home. You may have no use at all for any of those apps, but to my mind, they prove that Apple has figured something out. The company has realized that among the hundreds of thousands of iOS apps, there are many that are really great at getting very focused tasks done. It has seen that empowering Mac users to also transact such tasks is a logical extension of the company’s core message, the hallowed ‘Human Interface Guidelines’, if you would. You see, in Mojave, (as in iOS 12), Apple seems to have looked deep to send a message to all Mac users. That message is that the best applications are those that get out of the way. That the best platforms are those that focus on what their customers want to achieve. That the best way to support those missions is to try to — wait for it — get out of the way, but equip people with easy-to-use, but complex, applications that do the job without demanding too much of your time. With that in mind, my first impression is that Mojave seems designed to deliver a computing experience in which your interaction with the system is as friction-free as possible. One in which the computer itself tries to figure out your needs and then provide you with the tools you’ll use to achieve those needs. That’s a lesson that goes across all the Apple platforms in their upgrades in 2018. Described by some as “stability releases,” the principals (iOS and macOS) appear to have been put together with the end user’s needs in mind. Sure, humans are fallible — even the computer gods in Cupertino. I’m certain that as people kick the operating systems around, fresh flaws and ill-thought-through executions (such as that battery degradation by design fail we all lost patience about) will emerge, but surely the existence of a few foibles doesn’t undermine the core mission. Apple has a pretty good record for fixing its mistakes. Of course, the things you don’t see are often as important as the ones you do. Developers at WWDC 2018 met Apple’s new and advanced platform technologies: Core ML2, Create ML, Metal 2, and the new frameworks the company is building to support the process of porting iOS apps to Macs. Apple has also understood something else about how people use computers for self-expression. You need to be able to express yourself freely and in privacy. That’s why security and privacy enhancements are baked inside the entire system. You don’t work for the system; the system works for you. There are other new or recent enhancements: Macs will become fully 64-bit next year. Last year saw the adoption of lightweight yet powerful new file storage and imaging systems across its platforms. If you dig deep enough, you’ll see the company has been quietly refreshing the foundations of the Mac — the OS — for the last few years. Apple’s lightweight, cloud-savvy OS is built to run extremely efficiently on the world’s most advanced processors. Why might that be? What makes this attempt particularly refreshing is that within Mojave, Apple has also worked very hard to ensure that in what seem to be small ways, but will turn out to be incrementally profound, it has made the core system more productive than before and put you at the center of that experience. Of course, all of this is just my opinion. Apple has made macOS Mojave available as a public beta. Joining the scheme is simple, but I wouldn’t recommend installing it on your primary Mac. While I have found the beta very stable, it’s simply common sense to accept that you don’t install betas on mission-critical machines. That’s just asking for another of those figurative treks across the familiar desert valleys of abandoned backup routines and lost data tears. Even with a Dynamic Desktop. This isn’t a review, just a series of first impressions. I plan to explore individual features in more depth later down the line. I do want to say that I like this beta. I like its stability. I like what it seems to tell me about Apple’s direction with the Mac. Now, I’d quite like the company to follow it up with something like a new Mac mini.